You know how sometimes you are just looking for something and then quite by chance you come across something else that catches your eye. Happens to me all the time – short attention span. 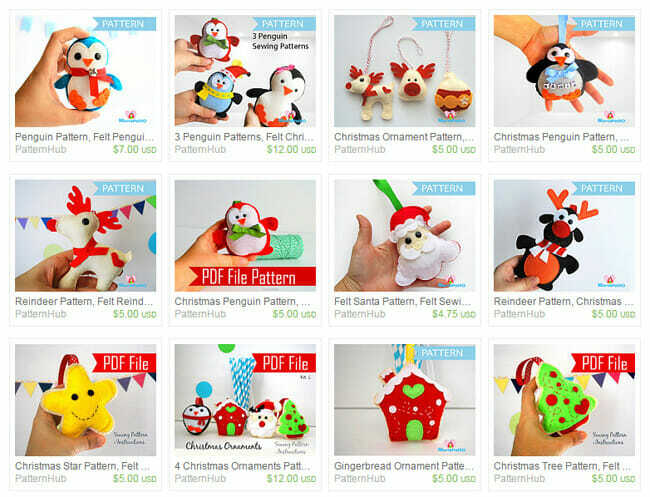 Etsy can be the worst for that and it was while browsing for some trim, that I came across the store for Maria Palito – she makes the most amazing felt toys, patterns and kits. 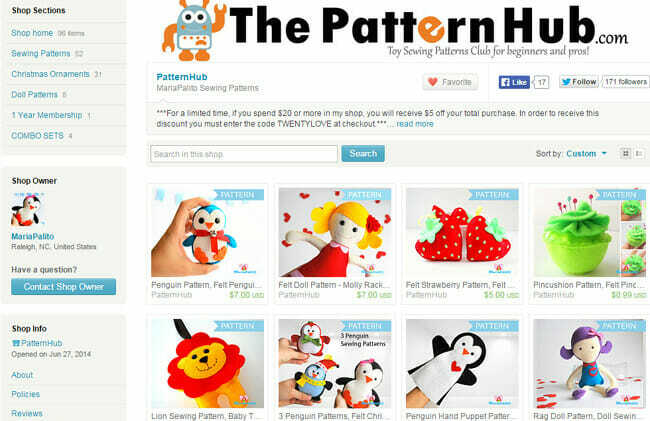 Check out The Pattern Hub on Etsy. You know me well enough by now that when I find something I think you might like, I try to do us a deal. So I asked Maria if she would create a pattern just for us, and give you the chance to win something from her store. She said YES to both – what a star! So enjoy below as she shares with us a Felt Baby Pig pattern she created exclusively for So Sew Easy, and enter the giveaway down at the bottom. I think these pigs would be perfect as skittles / bowling pins for kids to play with in the house, with a soft ball. Or if you are organising a kids party, how about they all get to make up something like this! I know a lot of girls would love to sit and sew something like this, for a girls crafts party and then get to take home a souvenir of the fun day. Or, check out the great range of Christmas decorations. These would be great to sew for a funraiser, fayre, Church event etc. Start by printing and cutting out the pattern pieces. Pin the pattern pieces to the appropriate colours of felt and cut them out. I usually print the patterns on card stock or in any thick paper. It will be easier to transfer the pattern into the felt. Use 8.5 x 11 inches card stock or paper. 2. Layout all the pieces and make sure you are not missing any part before you start stitching. Add some pins to secure the big pieces. 3. Stitch the white eyes (c) to the body (a). 4. Stitch the black eyes (f) on top of the white ones (c). 5. Stitch the nose (e) on top of the eyes (c) and include 2 white circles like the example. 6. Stitch the belly (b) on top of the body(a). 8. Align both pieces of the body (b) and start stitching the edge. 9. Stitch the edge of the toy, leaving a gap for filling. 10. Fill the toy but not 100%. Leave a space to fill at the bottom, you will fill it at the end when you finish the base. 11. To make the toy stand by itself you need to create a base. Start stitching the oval piece (g) by one side of the toy. Use Blanket stitch to stitch around until you finish the front section of the toy. You will need to insert a piece of cardboard before you close it. 12. Finish filling the toy and before closing it, insert a piece of cardboard or cardstock to help the toy stand up.Then close the toy. If you can't see the entry form in your browser, you can also enter HERE. Thank you, it’s been taken care of.